Known for its craft beers and fine chocolates, Brussels is the ideal destination for hospitality & catering students. To help you provide your group with an authentic Belgian experience, we’ve highlighted 5 must-see visits you should add to your itinerary when touring the Belgian capital. The art of chocolate is one famously hard to master. Students get to learn all the steps of the hand-production process; from tempering, preparing and filling the casts; to demoulding and packing. They can then taste the mouth-watering pralines and caraques; a traditional chocolate confection. Concept Chocolate specialise in personalised chocolates and are proud of their heritage. The staff enjoys sharing their knowledge with the public through hands-on workshops. This visit is a chance for students to be inspired by the fascinating world of chocolate making. Many visitors come to Brussels to try traditionally crafted beers. A visit to the Brewery Cantillon is a great opportunity to discover how craft brewing was done in Brussels at the time of the Industrial Revolution. Cantillon was founded in 1900 and belongs to a family of artisans brewers who cultivate their traditions and exclusively brew lambic beers. Students are introduced to the traditional production of Gueuze-Lambic, a mysterious beer resulting from spontaneous fermentation by airborne wild yeast. Beers are brewed in red copper containers, some more than 100 years old. The best way to explore a country’s cuisine is to get stuck in! 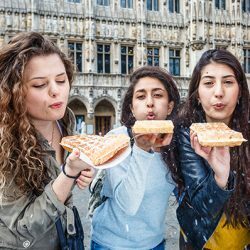 With a private guided gourmet tour, students get the chance to experience some of the many culinary treasures of Brussels. From pâté and smoked ham to sauces and craft beers, your taste buds are introduced to a whole new range of flavours. Students can develop their palates and expand their knowledge of the local cuisine by visiting some of the artisan producers and restaurateurs established in Brussels. This urban agricultural project is located in Tour & Taxis, a large formely industrial site. PermaFungi is a social cooperative which aims to take part in a more circular economy. The cooperative collects urban waste such as coffee grounds from local partners all over Brussels, mostly restaurants and coffee shops. Coffee grounds are a great base for growing oyster mushrooms thanks to the micro elements & minerals it contains. Guided visits for groups are available, taking students through workshops to learn more about this innovative and environmental friendly agricultural technique. Hospitality and catering students find out how to run a top hotel on this visit that offers a look behind the scenes of Brussel’s tourist industry. They get to see how staff work hard as a team to present a seamless level of service to guests, and how attention to detail is vital. Looking at a range of roles, this experience could inform future career choices. Brussels is filled with culinary discoveries and inspirations that will open up your students’ vision on European food. Click here to find out more about our Hospitality & Catering Trip to Brussels or get in touch with our team about booking a tour to Brussels.